Neu-Isenburg, Germany, November 2013. 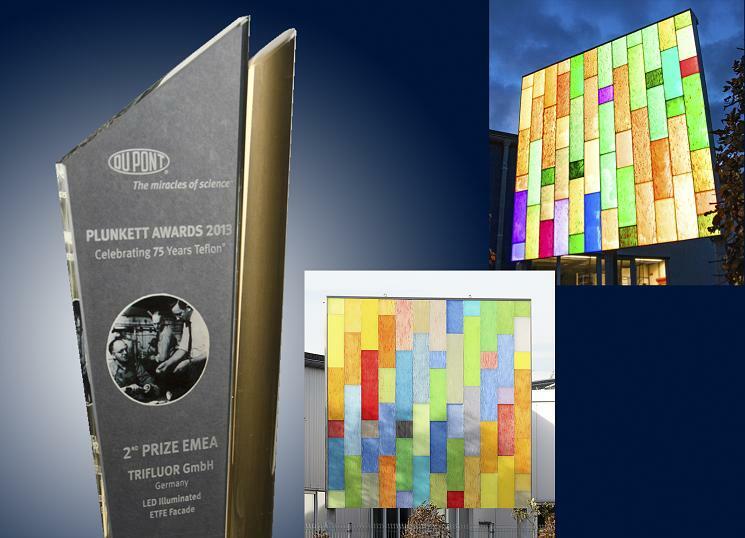 Trifluor Kunststoff GmbH, Ochtrup, has taken second place in the DuPont Plunkett Awards 2013 in the EMEA Region (Europe, Middle East and Africa). 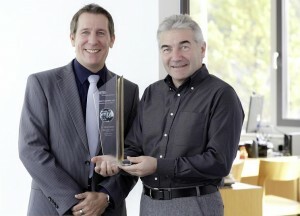 The company received the prize for an innovative extrusion process for the production of coloured and structured architectural membranes of ethylene tetrafluoroethylene (ETFE). The jury was particularly impressed by the fact that, due to an in-house recycling technology for fluoroplastics, these membranes can also be made from 100 % recycled material and therefore can contribute to greater sustainability. The Plunkett Awards 2013 coincide with the 75th anniversary of the discovery of PTFE by DuPont scientist Dr. Roy Plunkett and reward outstanding technical developments in the field of fluoroplastics. Erik Winkler, Account Manager Fluoropolymer Solutions, DuPont Chemicals & Fluoroproducts (DC&F) EMEA, presented the sculpture and the prize money of 5,000 USD to the Managing Director of Trifluor, Hermann Jenewein. Through variable pigment concentrations, Tiffany effects and different shadowing intensities can be created, resulting in new aesthetic design possibilities for roof and façade constructions, e.g. for public buildings. A prototype façade, which Trifluor has installed at its head office in Ochtrup, consists of a coloured membrane provided with Tiffany effects. The membrane is made of Tefzel® ETFE from DuPont, and is backlit at night with the help of LEDs. Trifluor Kunststoff GmbH is specialised in fluoroplastics and their processing. It offers innovative solutions for customer-specific problems, as well as a range of products based on thermoplastic fluoropolymers. The company’s customer and market-oriented alignment has led to many specialised, application-related product and system solutions in the fields of extrusion and injection moulding.